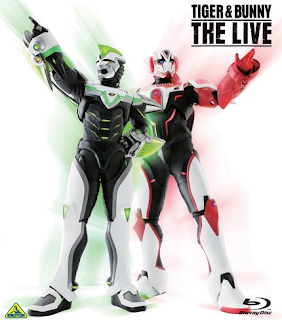 Tiger & Bunny The Live was a stage play which had a limited run between 24th August and 1st September this year. The venue was Zepp DiverCity in Odaiba, Tokyo; a small live house with a maximum capacity of 2,500 people. As this was a seated event, the audience was smaller than it would have been for a packed standing music gig. Although the show only ran for nine days there were seventeen performances in total. In spite of this, the demand for tickets was at fever pitch and there were many yelps of disappointment on Twitter when the ticket lottery results were announced. Tiger & Bunny was at the height of its popularity. A 'live viewing' was arranged which allowed fans without tickets to instead watch the performance in real time, either via the online Bandai Channel or in theatres. 99 cinemas across Japan offered live viewings of the very last evening performance, with 15 of the venues also showing the afternoon performance the same day in order to serve as many customers as possible. I was lucky enough to be able to attend the second of the live performances in Odaiba on opening day, though my seat in the fifth row on the second floor wasn't the best. One thing which surprised me was that the audience wasn't entirely female-dominated; women definitely made up the overwhelming majority of attendees yet I was seated close to some very enthusiastic male fans who provided a sense of balance. They were every bit as excited as the screaming girls and cheered loudly whenever Blue Rose came on stage. 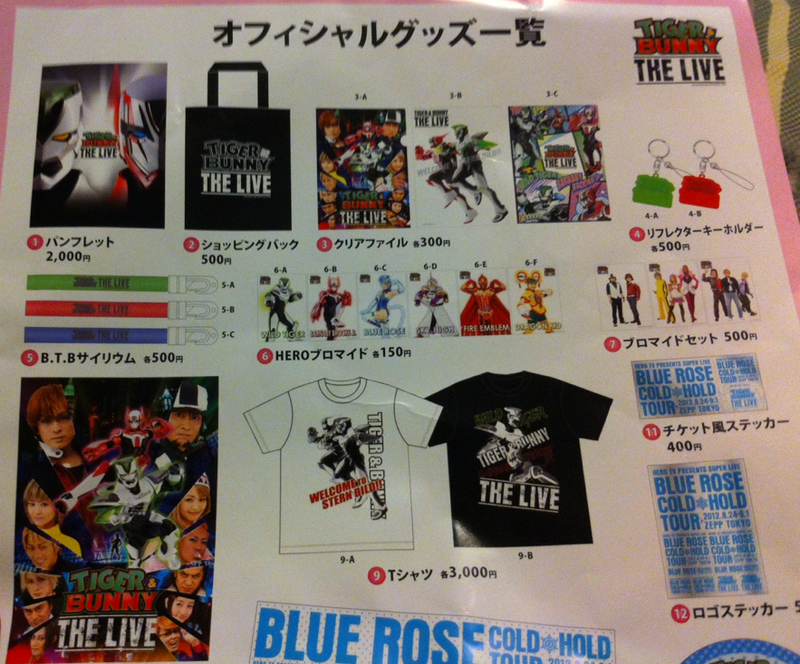 There were quite a few things which made Tiger & Bunny The Live special, from the detailed costumes to the blend of music and high energy combat. For me, one of the most exciting elements was that they'd arranged for the two lead seiyuu from the original anime series to reprise their roles for the stage play. Whenever Wild Tiger and Barnaby Brooks Jr. appeared in their civilian attire they'd be played by the seiyuu. For combat scenes, the duo would be played by performers in their hero suits. Since the hero suits cover their faces there was no problem with continuity as the seiyuu could still provide their voices from off-stage. I've seen a few complaints from western fans that Hirata is too old and stout to play the lanky Kotetsu. I disagree with them; his voice makes the character perfect and even if he can't match Wild Tiger's unrealistic physique, his acting skills are pretty good. Morita received loud cheering whenever he did anything cool - which was often - and it was obvious that he loved being on stage. He sang along adorably to his character song when it was playing and showed off some feisty fighting moves in a scene where the heroes battle in their everyday clothes. The reason that Sky High is credited twice despite not being one of the seiyuu guests is that his actor injured his leg in the final rehearsal - the day before the show opened. While it wasn't clearly stated what happened, there were hastily-printed posters all over the walls inside the venue on opening day warning the audience that there had been some changes to the show to accommodate this. The way that this was handled in the show I attended was that Eitoku appeared on stage a few times in his Keith costume, and for the combat scenes his understudy took his place. As Sky High's costume covers the character's face it was actually very smoothly done with the only complex aspect being where characters had to explain why Keith was sitting down in scenes where he should have been participating fully. The understudy did an amazing job, especially as the role was a difficult one. By the time of the final performances it seems that Eitoku had been ordered by his doctor to stop appearing in the show at all, so for the live viewings and home video version he's simply missing during the scenes where he should have appeared out of his suit (the characters acknowledge his absence in the dialogue). I hope that Eitoku didn't suffer too much and that he has made a full recovery since. It must have been terribly disappointing to be injured working so hard for a role, then being forced to miss out on the main event. At least he made it into the 'making of' documentary. Going back to the cast list, Mary Rose, Matthew and the two cameramen work for Hero TV, and Mr. M, Brian and Babel are original characters for the play's brand new story. All of the heroes appeared in both their hero costumes and their everyday attire as required except for Origami Cyclone and Rock Bison. The big surprise in the cast list was Ooba Kenji. He plays a fairly irrelevant side character who gives the heroes some advice and training, but as soon as he arrived energetically on stage there was a roar from the audience. A veteran sentai actor, Ooba is beloved for his work on Uchuu Keiji Gavan and the cast missed no opportunity to make Gavan-related jokes - in between all of his dropkicks, posing and dance moves. It's difficult to believe that he's 57 years old! I won't spoil the plot itself, as it's a filler story exclusive to the stage play. What I will say though is that I was very impressed by the way the show was staged. The storyline starts off at a B.T.B concert with Blue Rose singing and dancing, and the staff used this as an opportunity to involve the live audience with interviews which became a part of the performance. The venue was decorated with Blue Rose posters and the real cameramen blended in perfectly with the Hero TV actors who were covering the 'concert'. The heroes took every opportunity to run into the seating area and mingle with the audience; even those of us up on the second floor were treated to a surprise visit from Sky High when he launched an aerial attack. The special effects on-stage were very effective too. Rather than having a background made from props, there were a number of large colour screens set up right the way across the stage which changed dynamically with the story, so they were able to switch between a concert hall, a busy shopping street and other locations in an instant. These screens also became 'interactive' during fight scenes to make it look as though there were far more enemies on stage than would have realistically been practical. Ambitious choreography went hand in hand with the special effects to keep the audience on the edge of their seats. During one fight, Rock Bison dropped unassisted to the ground from a great height in a stunt which left my heart in my mouth! Needless to say, the actors were all first class. I've mentioned the leads already but everyone else was an ideal fit for their character too; there wasn't a single moment where I felt that anyone's voice or appearance looked out of place. My favourite was probably Fire Emblem. His towering height and physique was perfect, and in addition to this he played up his speech patterns and body language so well that there was loud applause whenever he had a line. 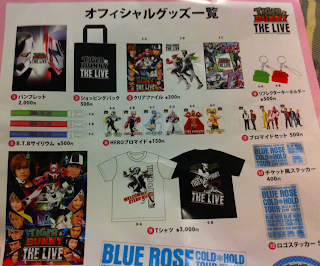 Pictured on the right is part of one of the pamphlets I received at the event showing the exclusive goods which could be purchased by attendees. The most attractive items were a Blue Rose muffler, some scrunchies and the B.T.B glow sticks. Naturally, these were all sold out long before I arrived at the venue on the first day. I resisted the temptation to purchase additional merchandise and sadly walked past the Blu-ray preorder desk, since my status as a foreign visitor made it impossible for me to place my order in person. The Blu-ray version comes with Japanese subtitles which makes following the dialogue even easier - though there are no English subtitles whatsoever, which is unusual for a Tiger & Bunny disc. There is also an audio commentary from the two 'hero suit' actors for Wild Tiger and Barnaby Brooks Jr., a 'making of' documentary segment, some bonus ' live viewing' and 'training room' footage from the afternoon performance where they'd used different gags, and a colour booklet with some extra information and short interviews. All in all, the BD was well worth the purchase. It's been great fun reliving my Tiger & Bunny adventure from last summer!